I was in Hong Kong last weekend for a romantic break with my wife. Remarkably, she did not consider going out at 2.30am to watch the Champions League final a romantic activity befitting of such a weekend. I was thus alone when I took my seat at the ‘Forever Lounge’ bar for the game. I’m not exaggerating when I say ‘my seat.’ I had enquired at around 10pm if they were going to be showing the game and they said yes but there were only a few seats left and I would have to pay a deposit to reserve one. I handed over 100 Hong Kong dollars while my wife looked at me in bemusement. “It’s the Champions League final darling,” is all I could offer by way of explanation. When the match kicked off, I gauged the bar to be reasonably evenly split in terms of support for the two teams. 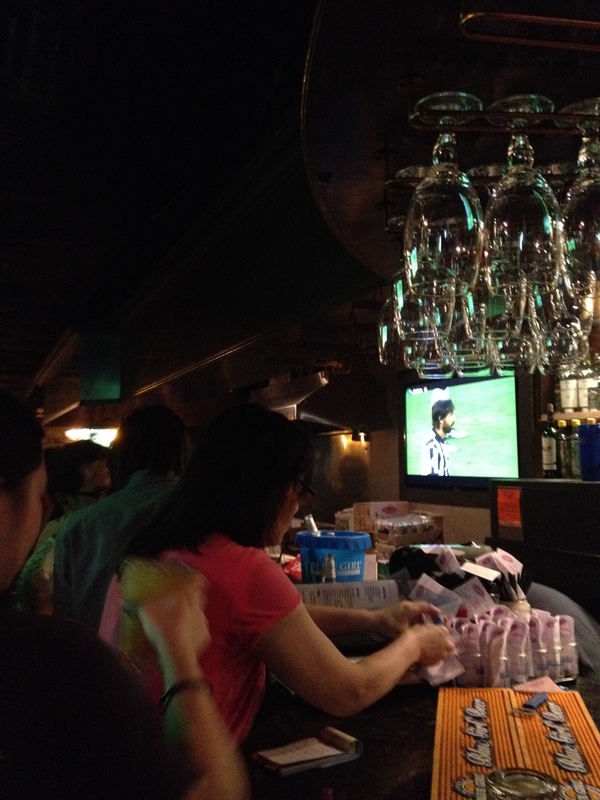 There were few replica tops on display (I only counted one Juve top and two Barcelona ones) and the opening goal for Barcelona seemed to excite roughly half of the patrons. It came as quite a surprise when the Juventus equaliser sparked celebrations that were wilder and more widespread. But back to the opening goal. It was well crafted from Barcelona’s point of view but it was a disaster for Juve. Rakitic was given so much space just outside the six yard box and must have been amazed to be given such a simple opportunity to score after just three minutes. I had written previously that the Italians are ‘masters of denying space.’ Ah, the dangers of predictive punditry. Undeterred, I took to Facebook with a short update – ‘Prediction: game over.’ And I was right, sort of. Barcelona should have had the game wrapped up by half time. The Rakitic goal was a prelude to a series of further clear cut chances. It was mostly the brilliance of Buffon in the Juve goal that ensured the game wasn’t over by the time the referee blew for the interval. I remained confident in my prediction but had just the tiniest amount of doubt. At half time I had a chance to reflect on a few things that had struck me so far. The biggest surprise about the game was how open it was. Most of the credit for that goes to Juventus who had chosen to try and attack rather than sit in and seek to nullify Barcelona. I had expected more defensive tactics from the Italians and had anticipated (wrongly as it turned out) that they would start with only one man up front. It was no surprise that Barca were dominant in terms of possession but their speed on the break was remarkable. Messi, Suarez, and Neymar are not actually the quickest front three but they move the ball incredibly fast and have developed an excellent understanding over the course of their first season playing together. Another intriguing factor about the first half was that Juve’s 4-4-2 formation with a narrow midfield gave them a man advantage in the middle of the park but they were entirely unable to dominate the Barcelona midfield three. The hype that surrounds Pogba is not unjustified but he is not yet able to control a game at this level by himself. A few other thoughts occurred to me at half time. Firstly, when did Messi acquire his tattoo sleeve? It was the first time that I’d spotted it and it seemed incongruous with his boyish image. On a related note, where do these players get their hair cut? The match was a parade of ridiculous hairstyles – Pogba, Neymar, and Alves chief among them. And why was Barca’s assistant manager dressed in denim? It’s the Champions League final, even the pundits put on their Sunday (or Saturday night) best for this game. As I was pondering all of this a curious thing happened. Sat across from me was a group of three guys sharing a bucket of beer. They finished one bucket and the waitress promptly delivered another one. Upon its arrival, one of the guys took a bottle of beer out and proceeded to spend the next minute attempting to open it with his teeth. He eventually succeeded and spat out the bottle top triumphantly. This display of machismo was rather undone however when he then took the bottle and shared it among the three small glasses that were on the table. It seemed like a lot of effort for a third of a bottle of beer. The second half began with Barcelona looking to prove me right in my prediction. Neymar missed an excellent chance from a Messi cross and that was the first of three chances for his side in the opening ten minutes of the second period. Once again, the game could and should have been all over. But then, all of a sudden, my prediction appeared in some jeopardy as Juventus found an equaliser. A low ball into the box was struck towards goal by a swivelling Tevez, the goalkeeper could only parry the ball out and Morata pounced to sweep the ball home. Having a second striker on hand to follow up and score from a rebound illustrated the benefit of playing with two up front (something for coaches to reflect on in an era that’s seen an increasing use of just a solitary striker). This was clearly now the key moment in the game. Could Juve build some momentum behind their equaliser? Would Barcelona’s confidence start to ebb? Was I going to end up with egg on my face for predicting the winner a mere three minutes into the game? It didn’t take long to realise that my face would remain egg free. Barcelona regained their rhythm almost immediately and while Juventus continued to pose a sporadic threat it was the Catalans who remained thoroughly in control. Juve did continue to try and press and take the initiative but in doing so they left themselves exposed on the break and it was thus that Suarez restored his side’s lead. Messi was the creator, running directly at and past several defenders before driving a shot that Buffon could only push into the path of a grateful Suarez. I was relieved and very shortly thereafter my prediction seemed entirely safe when Neymar nodded home a cross. His celebrations were cut short though with the referee correctly ruling that Neymar had used not only head but also hand in the act of scoring. The ‘goal’ was disallowed. In truth Neymar had made a terrible mess of an easy chance. The game still had a good flow to it and Juventus edged forward in search of a second goal of their own. Time and again however they left themselves short at the back and Barca were able to break with four or five players facing three Juve defenders. The Italians survived these breaks until the very end when Neymar did get his name on the score sheet from yet another incisive Catalan counter attack. With that the European Cup was headed back to Barcelona and I was headed back to the hotel to get to bed at 5am. Last season Barcelona didn’t win any trophies and many wondered if it was the end of an era at the Nou Camp or at least the beginning of the end. This season they have a treble to their name – La Liga, Spanish Cup and Champions League. They are without doubt the best club side of this century and the scary thought for rivals is that they may not even have fulfilled their full potential yet. Messi has been revitalised since the turn of the year and at his best he is close to unstoppable. I’ll make an early prediction for next season’s Champions League: if anyone knocks out Barcelona they will win the tournament. One final observation on my trip to Hong Kong, it was made in the gents. Over recent years there has been a worldwide move to improve men’s accuracy in the urinal. This has generally involved drawing a target on the point of the urinal that the authorities would prefer that we hit (sometimes it’s a fly, sometimes a frog, or sometimes just an X marks the spot). In Hong Kong, several establishments have installed small goalposts in the urinal with a ball suspended on string from the crossbar. I think goal line technology would be required to determine whether or not my shot did in fact cross the line. This entry was tagged Barcelona, Barcelona treble, Buffon, Champions League, Champions League final Berlin, Hong Kong, Juventus, Messi, Neymar, predictions, punditry, Suarez. Bookmark the permalink.